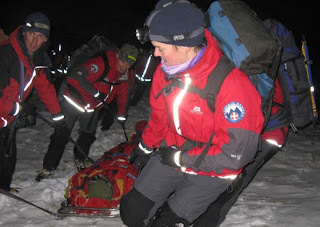 Hiking, Backpacking and Wild Camping Blog: Peak District Rescue Service - record breaking year. Peak District Rescue Service - record breaking year. A BUXTON-BASED voluntary rescue organisation has completed a record-breaking year — after receiving its highest number of calls for assistance ever. During 2010, Buxton Mountain Rescue Team was deployed 86 times and assisted 104 people in need across the Peak District and surrounding areas. Search dogs were also called to 30 incidents, assisting 43 people. Unpaid team members volunteered 2,243 hours to operations - equivalent to 320 working days - in addition to balancing work and family life, attending training events and fundraising, as it receives no Government financial support. Ian Hurst, Chairman of Buxton MRT, said: “There’s been a general increase over a number of years, not just for the Buxton team but for teams across the Peak District as a whole, and I wouldn’t expect that to change in 2011. But Mr Hurst added that the increased demand had put constraints on their resources. This year, the team will be replacing ageing protective equipment to the tune of £24,000, and aims to take delivery of a new 4x4 operational response vehicle which will cost around £40,000 to buy and equip. • To find out more about the team, visit their website www.buxtonmountainrescue.org.uk.